What is the function of hair? Hair in general has very little functional ability. It is there to protect our skin from sun exposure and harmful UV light and it also helps to regulate heat loss from the body. It may also help us increase our tactile sensation. Traditionally, fuller and thicker hair has been more of a symbol of eternal health, ageless beauty and confidence. Bold men and women are considered unattractive , older than their stated age and presumed to have health problems leading to social stigma and isolation greatly impacting their lives. Both men and women loose hair. Every day about 50-150 hair strands are being naturally lost as a part of hair growth cycle. There are many reasons for hair loss and thinning. These include diet and nutrition, genetics, chronic illnesses, medications, lifestyle choices, hair styling choices and hair products used. Men are twice as likely to be affected. 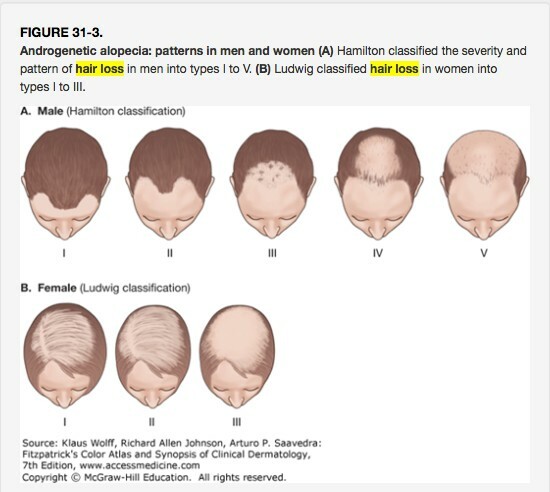 In men, alopecia may begin any time after puberty, so as early as in their 20’s and will be fully pronounced by their 40’s. Women usually start seeing hair loss much later in life, with majority after the age of 60. What is a hair life cycle? Hair life cycle consist of four stages from growth to falling out: Anagen, Catagen, Telogen and Exogen. Anagen phase (growth phase). This phase lasts weeks to years depending on the body site. About 85% of hairs are in this phase. During this stage the ultimate length of hair is determined. Anagen growth phase consists of rapidly proliferating epithelial cells which are exquisitely sensitive to toxic drugs, growth factors, hormones, stress, and immune system and physical injury. Destruction of these epithelial stem cells results in permanent hair loss, which is the target of laser hair removal. 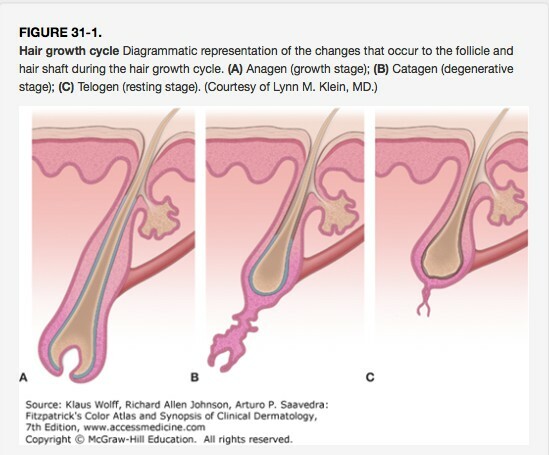 Catagen phage (transition phase) is a short phase of transition between anagen and telogen phase where the follicle slowly loses its nourishment and is being pushed upwards closer to the skin surface. This phase lasts only a few weeks and about 1% of hairs are in this cycle at any given point. Telogen phase(resting phase) It’s a relatively quiet phase where 1-14% of all hairs reside. The epithelial cells lining the hair follicle will begin migrate up and support the hair follicle independently from the body’s nutrient sources until the follicle breaks free from the root. This phase can last a few months. Exogen phase is an active phase of hair follicle falling out and is also knows as shedding. Normally about 50-150 hairs are lost daily in a healthy individual. Alopecia evaluation requires a very careful physical examination and health history questionnaire along with potential for blood work to exclude chronic illnesses and even scalp biopsy. Once the appropriate evaluation is completed, the available modalities include oral agents such as Finasteride, topical agents such as Minoxidil, hair pieces or wigs and hair transplantation surgery, and PRP. How can Dr. Avaliani help me? Dr. Avaliani will offer her expert opinion during her consultation and determine the best available option for you. 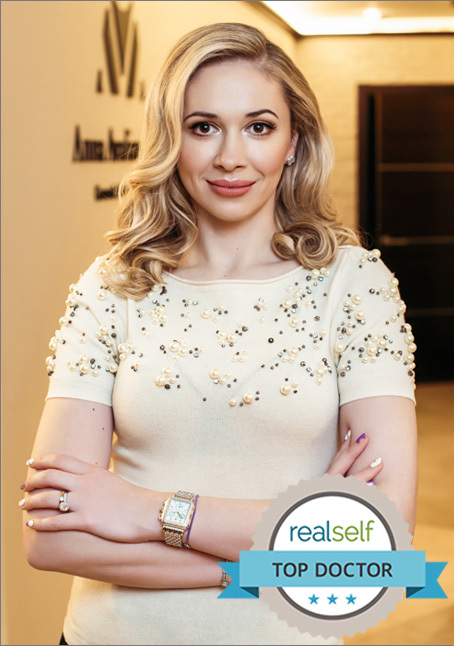 She is a leading expert hair restorative treatments using PRP + A Cell as well as in Neograft. To determine which treatment is best for you, please call the office for your no obligation consultation with Dr. Avaliani.